Does Your Firm Embrace the Social Network? It surprised me on my second day at my new job, when I walked by my secretary’s desk and saw her updating her Facebook status. At my old firm, the executive committee issued the verdict years ago to block all social networking sites, even LinkedIn. Not surprisingly, very few people at the old firm use social media sites and applications as a tool to promote the firm. Beginning during the interview process, I noticed a different perception of social media from the new firm. They expressed great interest in my blog and tweeting habits; I learned that several attorneys in the firm blogged as well and almost everyone had a LinkedIn profile. In the last few weeks, a couple of other attorneys have announced their intent to start a blog and several others have joined Twitter. Simply put, my new firm, a young, prestigious boutique firm, handling highly complex commercial litigation matters, embraces the social network. My old firm, an aging asbestos defense firm, rejects the social network. Two firms moving in opposite directions who share a very different outlook on the fusion of technology and law. My last post promoted my sister’s new book dealing with social networking and legal professionals, specifically attorneys using social media tools to market themselves in a job search. However, I firmly believe that the value of these tools extend far beyond landing the perfect job. Indeed, the perfect job involves utilizing these tools to promote, market, inform and engage clients, co-workers and the general public. As part of her book promoting tour, my sister travels around the country speaking at law schools and law firms on how to best utilize these social media tools. She reports that while many seem receptive to her presentation, many of the “old guard” still express reservations. Others may seem hesitant to change, but simply need to have the new tools explained in order to understand their importance. Where does your firm stand? Do they encourage you to actively engage in the use of social media tools or do they block Facebook, Twitter and LinkedIn, leaving you to believe they see these tools as toys? Going forward can a firm remain relevant without embracing these tools? Share your thoughts and I may use your feedback in an upcoming piece on this issue. 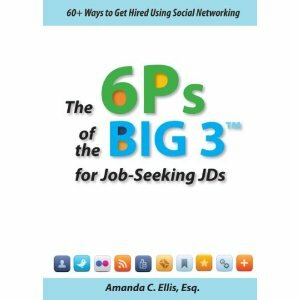 That is how attorney turned author, Amanda C. Ellis, describes her new book The 6Ps of the Big 3 for Job-Seeking JDs. I believe the advice found in Ms. Ellis’ book applies not only to law students and lawyers, but all legal professionals. Ok, so I am the author’s brother. Can you say nepotism? Seriously, the book contains great insight on how to turn your Facebook, Twitter and LinkedIn accounts into job creating machines. The results speak for themselves. Even if you’re not looking for a new job, the book contains many great ideas for getting the most out of your social networking accounts in your current place of employment. Who knows, it may help you land that next big bonus or promotion. Copies are available through Amazon.com and Ms. Ellis’ website.